Illinoispaytoplay.com has learned that Blagojevich’s attorneys’decision to not call John Chase to testify in their client’s trial was part of a backroom negotiation to insure that Blago spent little time behind bars. We’ve also been told to expect Blago to be released from prison…soon. You’ll remember that Chase is the Chicago Tribune reporter who informed Blago that John Wyma was co-operating with the U.S. Attorney, and that the feds were recording Blago. Chase recently revealed, in the book entitled Golden, that the U.S. Attorney's Office leaked information about their investigation of Blago to the Trib. Additionally, Chase revealed that he and co-author Jeff Coen, another Trib reporter, were given exclusive access to the federal government’s tapes and transcripts of the Blago wiretaps. (1) Why would Blagojevich’s attorneys not call the one witness who represents a serious problem for the prosecution (After all, Patrick Fitzgerald had established a precedent in cases involving leaks to the press)? (2) Why would the Feds give Chase exclusive access to the tapes and transcripts of government wiretaps after he derailed their investigation by revealing the existence of said wiretaps? (3) If what Chase and Coen assert in their book is true, that there’s nothing on the Blago tapes worth reporting, why do the feds refuse to make the tapes/transcripts public? And why were they sealed in the first place? (4) Why are Blago's attorneys so silent? 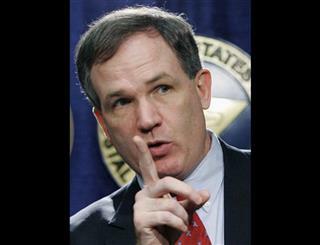 (5) Is it a coincidence that former U.S. attorney Patrick Fitzgerald is now Greg Craig's* business partner? * Greg Craig was Obama's White House Counsel. Did the Sun Times get played by Patrick Fitzgerald? Michael Sneed is the Chicago Sun Times columnist to whom Rod Blagojevich passed false stories that he wanted printed in her paper. This was documented in the Blagojevich trial. Now, it looks like Patrick Fitzgerald has taken a page from Blago’s playbook and followed Blago’s example. After Fitz publicly scoffed at the idea of joining a private law firm, he…joined a private law firm. “Sneed hears rumbles former U.S. Attorney Patrick Fitzgerald may be this/close to joining a prestigious law firm in Chicago. A Sneed source, who claims Fitzgerald had narrowed his choices to three firms, stated: ‘Everyone has been after him to join their firm. I’m told he should be making his decision within the next week or so… Close friends have speculated in the past Fitzgerald would become legal counsel for a large corporation.’"
Okay, so Sneed and the Sun Times’ editors recognized that the report that Fitz was about to flip-flop and go to work for a law firm was news. That was reasonable. But why are Sneed and the Times silent now when Fitz goes to work for the same law firm that represented Sam Zell and the Chicago Tribune, and, is, also, Greg Craig’s law firm? Craig, you’ll remember, was the White House Counsel for then President Elect Barack Obama. It was Craig who dealt with Fitz to clear Obama, Emanuel, Jarrett, and Axelrod of any wrong-doing in the saga of Blago’s effort to sell Obama’s Senate seat. Surprise! Makes you wonder if Fitz used the Sun Times, al la Blago, to distract attention away from the real story, doesn’t it?